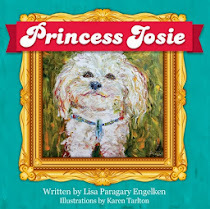 The delightful doggy Princess Josie was imagined by Lisa Paragary Engelken and brought to colorful 2D life by illustrator Karen Tarlton. This beautifully done children’s book opens up the realm of the imaginative, colorful world of a simple puppy who believes she is a princess and her family, the royal family. In this beautifully illustrated children’s picture book, young readers and toddlers alike (read to by a parent) will delight in Princess Josie’s sweet adventures, from chasing ferocious beasts (AKA squirrels) to protecting the “princes”. Princess Josie is a delightful children’s book now available for sale here, on the 3L site, Amazon and in select bookstores.